A leaky faucet can be a nuisance with a cost that can add up over time, depending on the severity of the leak. 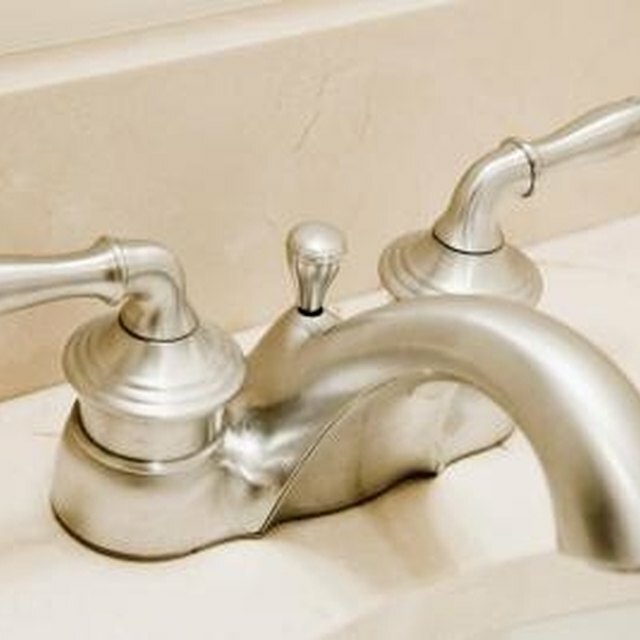 Wasted water that leaks from faucet handles also can cause corrosion to the fixture or stain the sink bowl. Fortunately, a leaky faucet is not cause to call a plumber. This simple repair can be completed in under an hour using tools most homeowners already have in the family toolbox. Remove handles to repair a leaky faucet. Turn the water supply off by turning the handle located on the supply under the sink. Turn the faucet to the "on" position to ensure the water is turned off. Remove the caps from the leaky handle. These can generally be removed by hand, but you may need to pry them off with a flat head screwdriver. Unscrew the handle assembly with a Phillips screwdriver. Remove the handle. Check the packing nut that holds the valve stem and internal packing for tightness. If this nut is loose, it could be the cause of your leaks. Replace the handle and turn on the water supply and faucet to see if it takes care of the problem. Turn off the water supply, remove the handle and remove the packing nut if the faucet continues to leak. Use pliers to pull out the valve stem that was held in place by the packing nut. Inspect the rubber seals and washers for signs of damage or decay that could cause leaks. Remove the brass screw at the bottom of the valve stem. Remove old o-rings, washers or seals and replace them with new ones. Replace the packing pieces in the same order as they were removed. Insert the valve stem assembly back into the sink and tightly secure it in place with the packing nut. Screw the handle in place and replace the cap. Turn the water supply on. Turn on the faucet to see if the handle leaking has stopped. Turn off the faucet to watch for spout dripping. Fix dripping that persists after replacement of valve packing by replacing the valve seat. Turn off the water supply and remove the handles and valve stems. A flashlight may be helpful to find the hole in the valve seat. Insert the valve seat wrench so its end enters the hole from which the valves were removed. The valve seat has a small hole that matches the end of the wrench. Turn the wrench counterclockwise to grip the seat. Pull upward to remove it. Place a new valve seat on the end of the valve seat wrench. Insert this in the same location where you removed the old seat and turn the wrench clockwise to lock it in place. Wipe away any debris from seat removal. Replace the valve stem and faucet handles in reverse order of removal. Turn the water supply back on. Compression faucets with two handles are most prone to leaks, but leaks in these faucets can be fixed by replacing washers. Single handle cartridge faucets usually require cartridge replacement to stop the leaking. Use the sink stopper to block dropped parts from slipping down the drain. If you are unsure of washer, cartridge or valve seat sizes, remove these pieces and bring them to a hardware store for assistance in finding an exact match. Some faucets have built-in valve seats that cannot be replaced. If the seat has a round hole without threading, a valve seat dresser can be used to grind out pitting or damage in the seat so replaced valves fit accurately.